Nien Tran RSM with Community Leader Moira Truelson RSM, Dr Margaret Secombe and Mary Harvey RSM at her Australian Jubilee Celebrations. When Nien Tran RSM fled Communist Vietnam in April 1975 she thought she would never again see the members of her congregation – the Lovers of the Holy Cross Sisters. 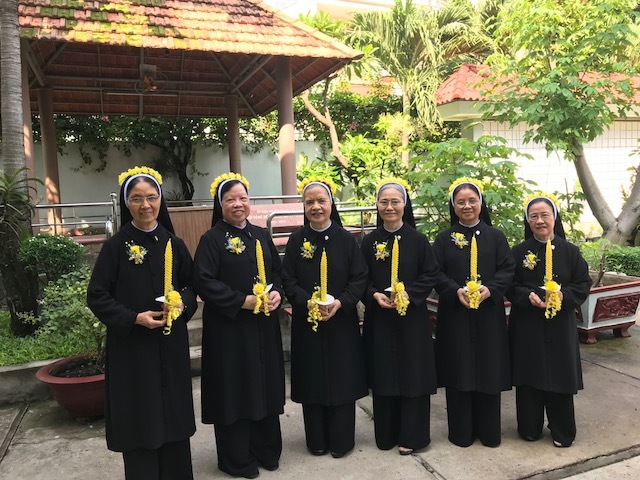 But she had a joyful reunion with six of the 12 Sisters with whom she took her first vows in 1968 when she recently attended her golden jubilee celebration in Ho Chi Minh City. Despite becoming a Sister of Mercy in 1991, Sr Nien remains closely connected to the Congregation of the Lovers of the Holy Cross which she joined as a 19-year-old woman in Saigon, Vietnam. After spending six years studying in France, Sr Nien returned to Vietnam in 1974 to take up a teaching ministry in Saigon (now Ho Chi Minh City), only to find it on the brink of capitulation to the Communists from the North. Nine months after she returned, on the historical day that Saigon fell (April 30 1975), she and nine Sisters in her congregation were forced to jump on a boat making its way to the Philippines. With nothing but some rice and a family photo album in her possession, she spent two months at sea before arriving in Guam where the US Government had established a transit camp. “We were on a very crowded boat with more than a thousand people; there were 10 Sisters in a tiny space and we had to take it in turns to lie down and sleep – five at a time,” she recalled. With other refugees, the Sisters were flown to the United States which had agreed to take in large numbers of refugees because of their involvement in the Vietnam War. But after a month in Pennsylvania, Sr Nien and Sr Mary Goretti (deceased) were sent to Adelaide by her former congregation, with the plan to resettle some orphans from Vietnam. 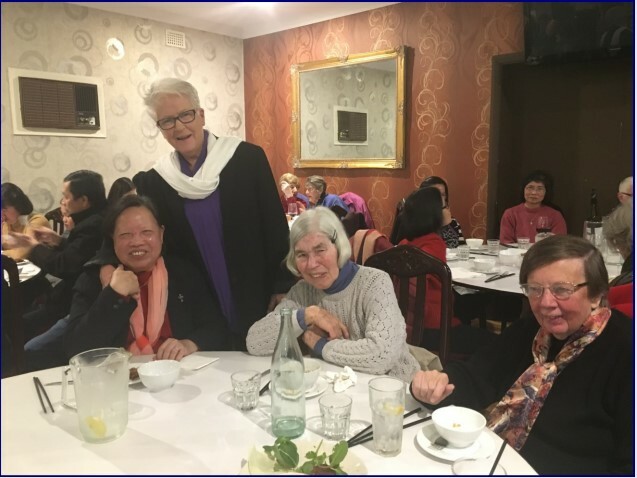 They began helping the Vietnamese refugees, especially the first Vietnamese Catholic group, with the support of Passionist priest Father Jeff Foale and while the orphans never arrived, Sr Nien soon found herself immersed in Australia’s multicultural life. Sr Nien worked closely with Archbishop Gleeson as he established the Vietnamese Catholic community in the Archdiocese of Adelaide. With the support of the Sisters of Mercy, she recommenced her university studies to become a secondary teacher in 1979. After sponsoring her mother to Australia in 1984, a year later she was supported by the Sisters of Mercy in bringing to Adelaide her two brothers, one of whom was training to be a priest. (Fr Tran Quang Tong was a priest at Salisbury parish and her other brother Minh-Hua Tran lives with his family in Adelaide. Her mother died in July last year). When Sr Nien first arrived in Adelaide she continued her mission for the Lovers of the Holy Cross but was treated like a Sister of Mercy and became increasingly attracted to its charism. “It was very similar to the Lovers of the Holy Cross who had nurtured my vocation,” she explained. After 10 years of reflection, Sr Nien’s renewal of vows and transfer took place in 1991 with the blessing of both congregations. “My connection with my first Order never stopped though; it’s as if now I have two congregations. I feel that 50 years of my religious life is a special call from God to service, it is an unique journey filled with God’s love, blessings and protection,” she said. “Through my career as a secondary teacher then lecturer at Adelaide University for 16 years, I felt I was able to use the gifts God had given me to help many students and to contribute to this multicultural country that I dearly love”. She received strong support from the local Church, including Archbishops Gleeson and Faulkner, and she was delighted when Archbishop Wilson invited her to join the Archdiocesan Multicultural Office in 2009. In her present ministry Sr Nien has continued her passion for learning and research in the area of multiculturalism and cultural adaptation of immigrants. She recently completed her PhD degree through Adelaide University on the topic of cultural and linguistic adaptation of Catholic immigrants in Australia compared with those in France. She strongly believes in the benefits of our Church in Australia being an inclusive and multicultural Church. When the opportunity came to return to Ho Chi Minh City for the golden anniversary celebration, her fellow Sisters of Mercy were insistent, telling her “it’s an anniversary of who you were”. Reunited: Nien Tran RSM (second from left) and Sisters of the Lovers of the Holy Cross at their Golden Jubilee held in June in Vietnam. More than 1000 people gathered in the convent chapel for the Mass, which also marked the 60 year anniversary of a group of Sisters and 35 first professions. Sr Nien was joined by her cousins, as well as two Sisters of Mercy and Father Jeff Foale who now lives and works in Vietnam. Unlike Australia, the Sisters wear the traditional nun’s habit so Sr Nien was measured as soon as she arrived and her veil and dress were ready within two days. It was the first time she had been back since 2007 and some of her group had not seen each other since Sr Nien left Vietnam. “When I first left Vietnam I thought I would never see my friends in the Congregation or my family because the Communists controlled the country,” she said. Sr Nien said she drew inspiration from her parents, particularly her father who died when she was only nine years old. He had been injured in the battle of Dien Bien Phu and never fully recovered but he told his children “God will look after you, I can assure you of that”.